Between November 1947 and May 1948 war between the Palestinian Arab community and the Jewish community encompassed Palestine, with Jerusalem and Jaffa becoming focal points in the conflict due to their centrality, size and symbolic importance. 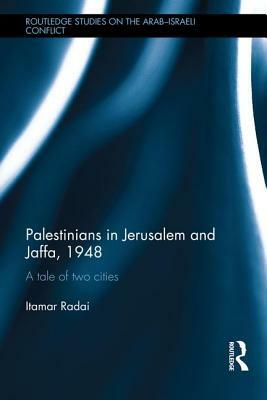 Palestinians in Jerusalem and Jaffa, 1948 examines Palestinian Arab society, institutions, and fighters in Jerusalem and Jaffa during the conflict. It is one of the first books in English that deals with the Palestinian Arabs at this crucial and tragic moment in their history, with extensive use of Arabic sources and an inquiry from the Palestinian vantage point. It examines the causes of the social collapse of the Palestinian Arab communities in Jerusalem and Jaffa during the 1948 inter-communal war, and the impact of this collapse on the military defeat. This book reveals that the most important internal factors to the Palestinian defeat were the social changes that took place in Arab society during the British Mandate, namely internal migration from rural areas to the cities, the shift from agriculture to wage labour, and the rise of the urban middle class. By looking beyond the well-established external factors, this study uncovers how modernity led to a breakdown within Palestinian Arab society, widening social fissures without producing effective institutions, and thus alienating social classes both from each other and from the leadership. With careful examination of a range of sources and informed analysis of Palestinian social history, Palestinians in Jerusalem and Jaffa, 1948 is a key resource for students and scholars interested in the modern Middle East, Palestinian Studies, the Arab-Israeli conflict and Israel Studies. Itamar Radai is academic director of the Konrad Adenauer Program for Jewish-Arab Cooperation and a research fellow at the Moshe Dayan Center for Middle Eastern and African Studies, Tel Aviv University.